In the 1960s, thermonuclear bomb tests released significant pulses of radioactive carbon-14 (14C) into the atmosphere. These major perturbations allowed scientists to study the dynamics of the global carbon cycle by calculating rates of isotopic exchange between the atmosphere and ocean waters. The Radiological Dating Laboratory at the Norwegian Institute of Technology performed 14C measurements of atmospheric CO2 from 1962 to 1993 at a network of ground stations in the northern and southern hemispheres; in addition it performed 14C measurements at high-altitude (between 9-12.6 km) during 1965 (Nydal and Lövseth, 1983, 1996). The Norwegian Radiological Dating Laboratory performed similar measurements on seawater samples collected at the ocean surface from 1965 through 1994. The resulting 14C ocean surface water database is documented here and is available from the Carbon Dioxide Information Analysis Center (CDIAC) as NDP-057A, free of charge. The data from NDP-057A, coupled with other 14C data sets, can lead to a greater understanding of the dynamic carbon reservoir and lead to a crude picture of anomalous sources and sinks at different geographical latitudes. The database is outstanding for its inclusion of early 14C measurements, broad spatial coverage of sampling, relative consistency of sampling methods, and δ14C calculation results corrected for isotopic fractionation and radioactive decay. This database replaces previous versions published by the author and the Radiological Dating Laboratory. A total of 950 ocean surface water observations were made from 1965 through 1994. The measurements were taken at 30 stations in the Atlantic Ocean, 14 stations in the Indian Ocean, and 38 stations in the Pacific Ocean. Thirty-two of the 950 samples were taken in the Atlantic Ocean during the R/V Andenes research cruise. 14C was measured in 871 of the 950 samples, and those measurements have been corrected (δ14C) for isotopic fractionation and radioactive decay. The δ14C values range between -113.3 and 280.9 per mille and have a mean value of 101.3 per mille. The highest yearly mean (146.5 per mille) was calculated for 1969, the lowest yearly mean value was calculated for 1990 (67.9 per mille) illustrating a decrease over time. This decrease was to be expected as a result of the ban on atmospheric thermonuclear tests and the slow mixing of the ocean surface waters with the deeper layers. The range of δ14C values is large and depends on where and when the sample was taken, i.e., upwelling areas, far northern or southern latitudes, near fresh water influxes, temperature, salinity. Besides the corrected 14C data, the 13C data used for correcting the 14C data for fractionation are provided as are the temperature, salinity and depth measurements, and information on where and when the samples were taken. Data are plotted vs time and vs latitude with ocean designations to provide quick overviews of data patterns. The data are fully listed and are available as one file of around 0.08 megabytes. The format of the data file permits easy import into PC-based spreadsheet software like Microsoft Excel. Programs to read and print the data file (FORTRAN 77 and SAS®) are provided also. Given the long period-of-record, this database may serve as a baseline for 14C measurements collected during more recent oceanographic cruises including the World Ocean Circulation Experiment (WOCE), Joint Global Ocean Flux Study (JGOFS), Transient Tracers in the Ocean program (TTO), South Atlantic Ventilation Experiment (SAVE) data, and the older Geochemical Ocean Sections Study (GEOSECS). The carbon-14 radioisotope (14C) resulting from atmospheric nuclear bomb testing during the 1950s and 1960s can be used as a tracer to study carbon dioxide (CO2) exchange between the atmosphere, biosphere, and ocean. Natural atmospheric 14C, occurring as 14CO2, results from natural nuclear reactions between cosmic ray neutrons and atmospheric nitrogen. The natural equilibrium between the production and disintegration of 14C (half-life of 5,730 ± 40 yrs) determines in part the existing natural background radiocarbon levels. The nuclear tests in the atmosphere , with a total strength of 430 megaton (TNT equivalent) in the period from 1945 to 1980, added dramatically to the presence of atmospheric 14C (Nydal and Lövseth 1983, 1996). About two thirds of this yield was released by the Soviet Union in the stratosphere at high northern latitudes (e.g., Novaya Zemlya in the former Soviet Union) in 1961 and 1962. A Test Ban Treaty, signed by the USA, the Soviet Union and Great Britain on August 5, 1963 ended atmospheric testing for these nations. France and China continued, however, with smaller fission bombs. France performed the last atmospheric test in September, 1974, and China in October, 1980 (Norris and Arkin 1994). Nuclear power reactors are another source, although minor (depending on the efficiency of the filtering system), of atmospheric 14C (Nydal et al. 1980). From 1962 through 1994, the Norwegian Radiological Dating Laboratory, under Dr. Reidar Nydal, conducted regular measurements of 14C in the atmosphere at ground level; in the lower stratosphere and in high altitudes using aircraft; and in the surface waters of the various oceans using research ships and ships of opportunity. Final results of the atmospheric measurements have been documented and archived at the Carbon Dioxide Information Analysis Center (CDIAC) at Oak Ridge National Laboratory (Nydal and Lövseth 1996). 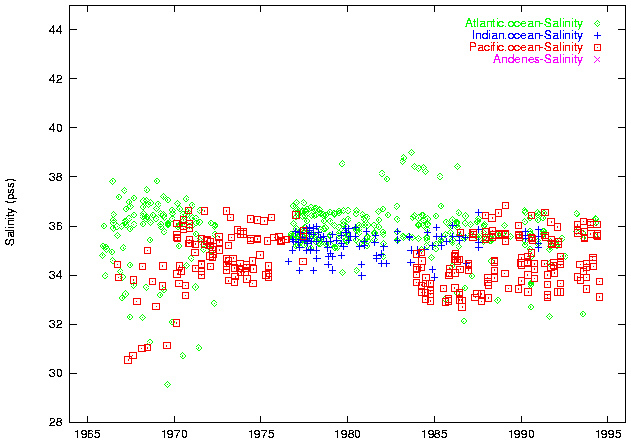 The previously published ocean data through 1981 (Nydal et al. 1979, Nydal et al. 1980, Nydal et al. 1984) have been updated and corrected for radioactive decay. The final version with data through 1994 is documented in this database (NDP-057A). Sampling of the ocean surface waters for 14C was performed from cargo ships on their regular routes and from Norwegian research vessels. The Norwegian shipping companies Fred Olsen and Wilh. Wilhelmsen collected the samples on their ordinary routes through the Atlantic, Pacific and Indian Oceans. From 1965 until 1976 there were a large number of possible routes; about six ships were involved in the sampling. The sampling was shared between the two shipping companies in order to cover the main part of the world ocean surface between 45° N and 45° S. The ships crossed the Atlantic Ocean from Europe to North and South America, went along the African coast, passed through the Panama Canal to the Pacific Ocean to New Zealand, Australia, and Japan and returned either over the Indian Ocean and around the Cape of Africa or through the Suez Canal. Ships also sailed in the opposite direction, over the Indian Ocean to Australia before crossing the Pacific Ocean to Panama (Fig. 1). Big changes occurred in the shipping routes after 1973. A few ships were then selected to cover most of the earlier established sampling locations. After 1986 sampling was reduced to only one ship from the Wilh. Wilhemsen line. That ship (the M/S Tourcoing) was able to cover some of the previous sampling locations. Its main route led from Europe, across the Atlantic Ocean to Panama, across the Pacific to New Zealand and Australia, and north to Japan before returning through the North Pacific and Atlantic Ocean. Special cruises by Norwegian research vessels, the M/S G.O. Sars, M/S Lance, M/S Mosby, and M/S Johan Hjort, sampled the Nordic Seas from 1965 to 1967 and 1990 to 1992; the R/V Andenes sampled the Atlantic Ocean during a round-trip research cruise to Antarctica from 1989 to 1990. Table 1 provides an overview of when the particular ships were involved in sampling. Samples taken through 1994 have been processed for this database. From all ships, a total of 950 observations were made from 1965-1994; of these a total of 871 observations of 14C have been corrected for fractionation and radioactive decay (see Sections 14 and 15). Table 1. Sample identifications, ships involved and sampling period. Fossil fuels are devoid of 14C due to radioactive decay of 14C to 14N. Fossil-fuel combustion has thus resulted in reduced atmospheric and oceanic 14C/12C ratios. δ14C values are deviations from the 14C/12C ratio relative to the National Institute of Standard Technology (NIST) oxalic acid standard, that are not yet corrected for radioactive decay. Nydal et al. measured 14C and 13C such that the δ14C values and δ13C could be calculated and such that the δ14C values could be corrected for isotopic mass fractionation and for radioactive decay (see Section 6). Nydal considers the δ13C values in this database appropriate for the correction of the 14C measurements, but did not consider them representative of true ocean bicarbonate levels. In principal, changes both in δ13C and δ14C values can be used as tracers of CO2 fate over time (Nydal and Lövseth 1965; Nydal 1968; Nydal et al. 1980; Nydal and Lövseth 1983). Temperature, salinity, and sampling depth were measured for almost all sampling locations. Those data are incorporated in this database; they may aid in the interpretation of the variability of the radiocarbon data. In contrast to planned research cruises, locations for sampling with commercial ships were dependent on shipping routes (Fig. 1). In addition, weather situations caused changes in the routes throughout the year, making it difficult to return to the same position during subsequent cruises. After some time 'stations' (Table 2) were defined, containing one to any number of samples taken over time within a few degrees latitude and longitude (Nydal et al. 1984). Because of a large number of additional samples presented in this report, compared to the 1984 publication, it has been necessary to make slight changes to the earlier arrangement of the stations (compare Appendix B, and Table 7). Station size was probably not critical in the open ocean, but closer to the continents (e.g., West Africa) even small changes in the location may have had great influence on the 14C/12C ratios. At the beginning of the project, the sampling locations were chosen more or less arbitrarily at intervals of several degrees in order to cover the main ocean surface. Some of the sampling locations were not revisited after a short time, often due to changes in the shipping routes, but also in favor of more interesting locations. In some cases it was possible to establish stations where sampling was repeated during several years in each of the three oceans. Various cargo ships (listed in Table 1) were involved in the collection of samples. Two ships, the M/S Bolinas and M/S Bandairante from the Fred Olsen Company covered most of the Atlantic for 10 years (1966-1972). Several ships (the M/S Bolinas, M/S Bandairante, M/S Torrens, M/S Tiber, M/S Toledo, M/S Tungsha, M/S Tarn, M/S Taimyr, M/S Trinidad, and M/S Tricolor) from the Fred Olsen Company and from Wilh. Wilhelmsen (Barber International) covered parts of the Atlantic, Pacific and Indian Ocean during the same period. From 1966 until 1976 the seawater collected (in 200-liter barrels) was transported to the laboratory for further processing after two to four months of storage. The running sample identification numbers SV1-SV286 were assigned to the samples from this period. After the reorganization of the sampling program in 1976 it was found more convenient to have the sample numbers connected to each ship (M/S Torrens, M/S Barber Tønsberg, M/S Tricolor, M/S Tombarra, M/S Tourcoing) because the flushing procedure for CO2 collection was performed by the staff (the chief) on board the ships (see Section 6). The Atlantic Ocean was covered with 30 stations (S01-S28, S07B, and S11B) from the Barentz Sea (74° N) to the South Atlantic (35° S). One of the sampling stations is located in the Mediterranean Sea (Station 14). Measurements from these 30 stations were complemented with measurements from a special sampling series on an Antarctic cruise by the Norwegian research vessel Andenes (An0), sailing between 1989 and 1990. Thirty-two samples were collected on that cruise in the region from 45° 03' N, 8° W to 73° 58' S, 56° W (see also Nydal and Gislefoss 1996). Twenty-two of these samples are listed under Station An0; the other ten sampling locations were added to the appropriate Atlantic Ocean stations, namely, A-00001# and A-00001(2) to Station 7, A-00002 and A-00002(2) to Station 17, A-00003 and A-00003(2) to Station 19, A-00004 and A-00004(2) to Station 21, and A-00007 and A-00007(2) to Station 23 (see also Section 14); the remaining data are listed under Station An0. The locations for each Atlantic Ocean station, the number of samples, and the sampling periods are summarized in Table 2. Table 2. Sample stations and collection dates from the Atlantic Ocean. 1In brief, the Atlantic component of this database offers one time series spanning 25 years (1966-1990) with 65 samples (S17) for the coast of Africa; 15-year time series between 1976 and 1990 for S07, S20, S22, S25 and S27; 8-10 year time series for S11B, S09, and S07B; and an 8-year time series for the station in the Mediterranean Sea (Figs. A-1 thru A-10). Other station records are generally less than 8 years and are not plotted as individual time-series. The Indian Ocean component of this database contains measurements from 14 stations (S31-S45, S40 is listed under S43) mainly from the open ocean between 7° S and 45° S (Table 3). The samples were collected on cruises between Australia and the Cape of Africa or the Red Sea. All stations in the Indian Ocean were situated on the deep basins with depths greater than 3000 meters. Table 3. Sample stations and collection dates from the Indian Ocean. The measurements in the Indian Ocean offer records spanning 12-15 years for stations S41 and S43 and 8-10 years for stations S32, S34, S37, S39, and S44 (Figs. A-11 thru A-15). Records from other stations have shorter durations. The Pacific Ocean component of this database consists of 38 stations (S51-S88, S61 was combined with S60). 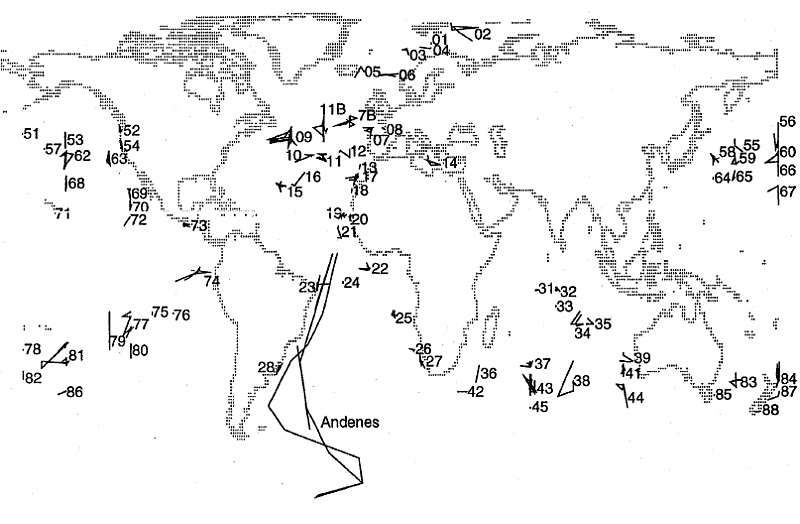 These stations were located mainly between North America and Japan in the northern hemisphere, and between Panama and Australia in the southern hemisphere (Table 4). Normally, sample collection took place when crossing certain longitudes. The majority of the stations were located in calmer surface layer from 15° N to 35° N and 15° S to 35° S. Frequent changes in shipping routes, due to the weather changes between summer and winter, caused a scattering of the stations in the longitudinal direction. Table 4. Sample stations and collection dates from the Pacific Ocean. Measurements in the Pacific Ocean were less systematic than in the other oceans. Shipping route changes in the 1970s had great influence on the consistency of the measurements. Sampling was mainly performed in the periods 1966 to 1975 and 1983 to 1994. Station locations were mostly scattered in the first period, and the maximum length of any record was only 4-5 years (S52, S73, S77, S81, and S84). Greater sampling consistency was obtained in the second period, with records spanning 6-10 years at some stations (S53, S56, S58, S59, S63, S77, S81, S83, and S84) (Figs. A.16-A.24). For conventional 14C measurements, a CO2 volume of about 5 liters was needed, for which about 200 liters of seawater had to be collected. The seawater was collected through the inlet of the ship's cooling system and stored in cleaned steel 200-liter barrels. Temperatures and sampling depths were recorded at the time of sample collection. The air in the 200-liter barrels was removed by nitrogen flushing before filling. Subsequent treatment of the samples changed with time. During the first 10 years (1965-1976) the barrels were stored aboard the ships during the cruises, and processed 2-4 months later in the laboratory. After acidifying the seawater (to pH<3) with concentrated sulfuric acid, the CO2 was flushed out with nitrogen and adsorbed in ammonia (later to 2% 0.75 L NaOH). Flushing times varied between one and two days, and in general a 5-6 liter volume of clean CO2 gas was obtained after further precipitation with CaCl2, filtration of CaCO3 and further treatment with HCl (later with H3PO4). In 1976 the sampling program was revised to eliminate the long storage of seawater in the large barrels on board the ship and the subsequent transport to the laboratory. Between 1976 and 1983 the flushing of CO2 was performed more systematically, i.e., the samples were flushed immediately after collection for 1.5 hours with 600 liters of pure nitrogen and adsorbed to 2% NaOH (0.75 L) on board the ship just after collection (Nydal et al. 1980, Nydal et al. 1984). Four to five liters of CO2 were still obtained. The revised procedure made it possible to collect and handle more samples on each cruise. When the samples (in NaOH solution) were received in the laboratory they were directly treated with acid in a vacuum system for further CO2 release. After 1983 the flushing of CO2 was again revised: a circulation pump on top of the barrel circulated excess nitrogen through the barrel resulting in a more complete extraction of CO2 from seawater within 2.5 hours. 13C measurements. 13C/12C ratios were measured by mass spectrometry. The δ13C values (the deviation in the 13C/12C ratio relative to the PDB standard) obtained during these measurements are relative values and are not representative of ocean bicarbonate values, mainly because of the storage (biological activity) of the seawater and the variable flushing procedures. Correct δ13C values for ocean bicarbonate can only be obtained after complete extraction of CO2 in a sample, and before any exchange between organic and dissolved inorganic carbon occurs. 14C measurements were the focus of the present work, and satisfactory precautions for representative δ13C measurements were not taken. When CO2 is only partially removed, the gas is enriched in 12C and a negative δ13C value is obtained. The large range (from positive to negative values) of δ13C values can thus be explained. Most of the δ13C values for 1965-1976 ranged between 0 and 3 per mille (o/oo) and were fairly close to actual ocean bicarbonate values. There are, however, also some highly variable results with extreme values above 20 o/oo. In the latter cases it can be assumed that leakage in the flushing system had occurred and that the result was enriched 13CO2. It seems unlikely, however, that the 14C values (after correction) were affected because of excess pressure in the flushing system. After 1976 and up to 1983 a less complete flushing (reduced time) on board the ship resulted in general in negative δ13C values, i.e., a mean δ13C value of - 6.5 o/oo. Deviation in δ13C from the normal ocean value varied, depending on how complete CO2 was extracted from the seawater. After 1983, the circulation pump proved to result in more complete extraction of the CO2 and the δ13C values showed more typical ocean bicarbonate values. 14C measurements. 14C was analyzed in CO2 proportional counters with gas volumes of 1-2 L under 2 atm pressure, similar to the atmospheric CO2 measurements (Nydal et al. 1983, Nydal et al. 1984, Nydal and Lövseth 1996). Until 1976 the samples were measured with an accuracy of about 10 o/oo during counting time of 24 hours. Afterwards, in order to obtain higher precision (5-7 o/oo), counting times were increased upwards to 4 days. In step 1, the 14C excess (δ14C) is only corrected for isotopic mass fractionation. δ14C represents the uncorrected (for decay) 14C relative to the NIST standard and δ13C represents the deviation in the 13C/12C ratio relative to the PDB standard. The 13C/12C ratio was measured by mass spectrometry. The δ13C values, by themselves, represent data that are highly influenced by fractionation in the flushing process. In the earlier presentation of the 14C data from the Radiological Dating Laboratory only step 1 was used, and the decay of the NIST 14C reference standard after 1950 was not taken into account (Nydal et al. 1983). Applying the approximate formula in step 2, where is 1/8267 years (T/ln2 where T is the 5730 year half-life of 14C) and t is the year of sampling, this small decay (2-5 per mille) has now been applied to all the 14C data appearing in this database. Negative values were occasionally obtained in the Arctic and Antarctic (Figs. 2, 3, and 4). These values can be explained by the more rapid vertical exchange of deep water in the Arctic and Antarctic. Before the nuclear bomb testing all values in the ocean were negative due to the mean age of the ocean carbon being ca. 500 years. Temperature. The seawater temperature was measured where the samples were taken using an automatic recorder at the inlet of the ship's water-cooling system. The accuracy of this temperature-recorder was generally better than 0.5C. Control measurements of the temperature were also performed with a thermometer in the barrel at the end of the filling process. Salinity. Normally, one liter of seawater was put aside for salinity measurements from each sample. Salinity measurements were performed at 22.5C with an Inductor Salinometer at the Marine Biological Station in Trondheim. The salinity measure is presented here in units of the practical salinity scale (pss) following the National and International Ocean Organizations' directives. This scale is defined as a conductivity ratio without unit. This salinity standard is in agreement with previously published salinity numbers given in per mille units. The limit of error (1 sigma=0.003 pss) in each case is certainly small compared to the error associated with the storage of the samples. The samples collected before 1976 were often stored several years before measurements. Some extreme deviations in salinity may be due to bottle leaks during storage. After 1976 the salinity measurements became more regular, but storage time was often still longer than 3 to 4 months. In spite of the relatively poor quality of the salinity measurements, they still offer some information about the stability of the water masses in the open ocean and along the continents. The measurements are especially important for revealing the intrusion of freshwater from rivers (e.g., at the coast of Argentina and at Washington, USA). Depth. Depth values are equivalent to the depth of the inlet on the ship's water-cooling system where the 200-liter samples were collected. Depth values ranged between 2.5 and 11 meters. Sample LA2-0002A from Station 2 has a depth of 50 m because the surface sample had been lost. That sample belongs to a 14C depth profile in the Barentz Sea that showed small variations in 14C all the way down to the sea bottom. For a further discussion of the sampling methods and each sampling site, please see the reprint of Nydal et al. (1984) in Appendix B. The ocean surface water 14C measurements documented in this NDP-057A and the atmospheric 14C measurements documented in NDP-057, coupled with other 14C data sets, can lead to a greater understanding of the dynamic carbon reservoir and lead to a crude picture of carbon fluxes at different geographical latitudes. The database is outstanding for its inclusion of early 14C measurements, broad spatial coverage of sampling, relative consistency of sampling method, and δ14C calculation results corrected for isotopic fractionation and radioactive decay. This ocean 14C database replaces previous versions published by the authors and the Norwegian Radiological Dating Laboratory. Given the long period-of-record, the ocean surface water 14C data may be compared to the data obtained from more recent oceanographic cruises including the World Ocean Circulation Experiment (WOCE), Joint Global Ocean Flux Study (JGOFS), Transient Tracers in the Ocean program (TTO), South Atlantic Ventilation Experiment (SAVE), and the older Geochemical Ocean Sections Study (GEOSECS). δ14C, temperature and salinity data from those stations sampled multiple times over the 1965 to 1994 period were plotted (Figs. A.1-A.26) as mentioned before. As a brief overview of all data, we also plotted all δ14C values, d 13 C values, temperatures, and salinities vs time and vs latitude (Figs. 2-9). 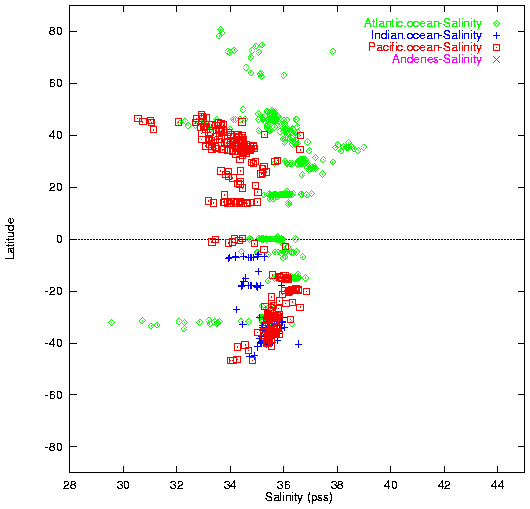 Figure 2 includes the atmospheric δ14C data from NDP-057, the ocean surface water δ14C data obtained from GEOSECS (Östlund and Stuiver, 1988, NDP-027), and δ14C data from the WOCE section P17C in the equatorial Pacific Ocean (Goyet et al. 1997, NDP-062). Analogous to the atmospheric δ14C data, but not to the same degree do we find, with time, a decline in the surface water δ14C values indicating the slow mixing of the surface ocean water with the deeper layers. The scatter in the ocean surface δ14C data is largely due to the fact that the data plotted are from a large variety of locations, differing in upwelling aspects, temperature, salinity, latitude, etc. 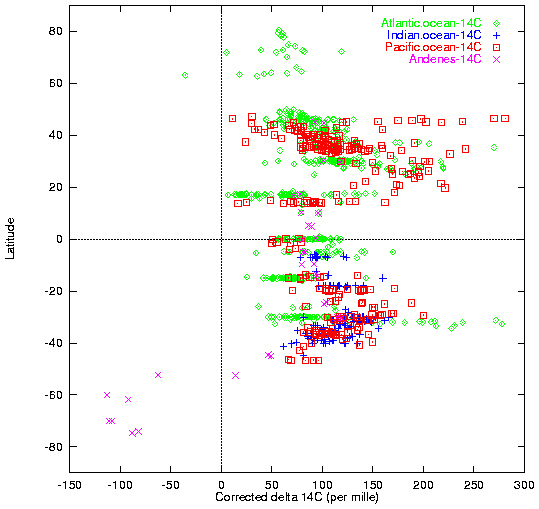 Figures 3 and 4 show only the NDP-057A ocean water surface δ14C data with ocean-specific symbols plotted vs time and vs latitude, respectively. 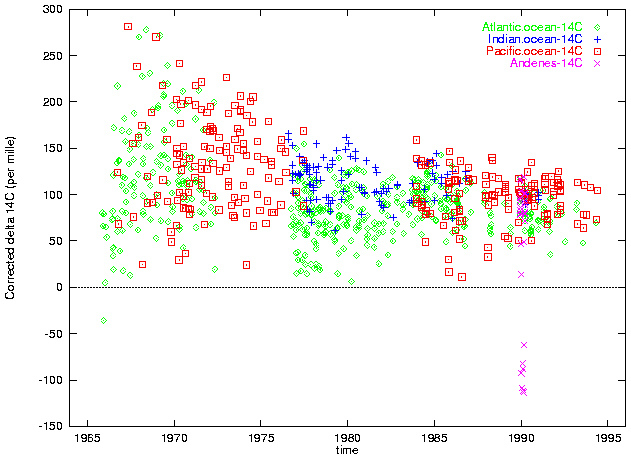 The δ14C latitudinal plot shows clearly that lower values were measured around the equator caused by upwelling of deeper, older ocean waters around the equator (see also Stuiver and Östland, 1983). Near the Antarctic, deep mixing with cold centuries-old water that lacks 14C results in the negative δ14C values. 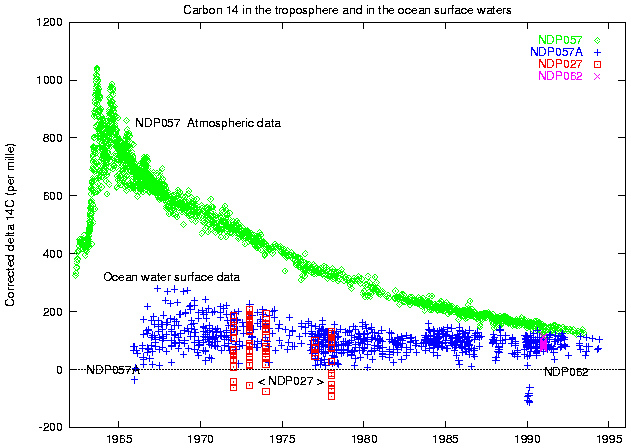 Figure 5 shows the oceanic (this NDP057A) and atmospheric (NDP057) δ13C values over time. The paragraph on δ13C values in the previous section (pp. 11 and 12) explains the ocean δ13C values in Figure 5, i.e., the effects of the changes in flushing times. Figures 6 through 9 plot temperature and salinity vs time and vs latitude. 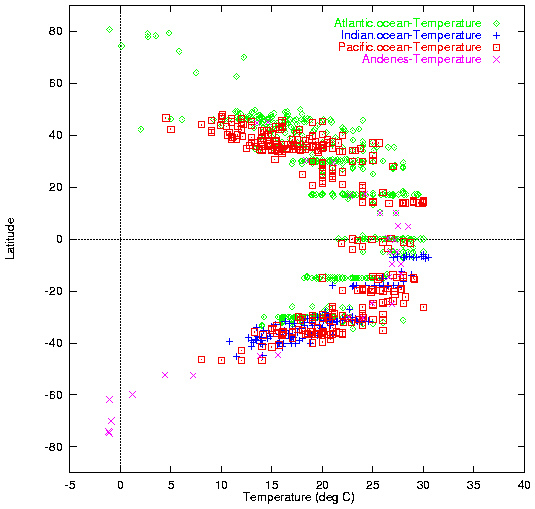 The latitudinal temperature plot shows an expected pattern of warm temperatures between 23° N and 23° S. The highest salinity values are found in the North Atlantic Ocean in the early 1980s. Figure 2. 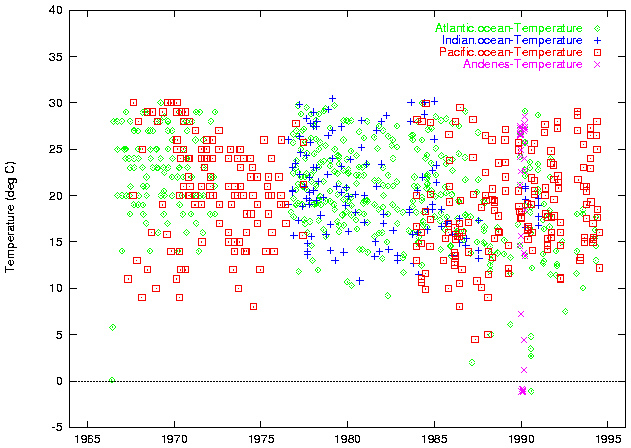 Atmospheric and oceanic corrected 14C measurements over time. Figure 3. Corrected 14C measurements over time. Figure 4. Corrected 14C measurements by latitude. Figure 5. Oceanic and atmospheric 13C measurements. Figure 6. Temperature data over time. Figure 7. Temperature data by latitude. Figure 8. Salinity data over time. Figure 9. Salinity data by latitude. Sample storage time. Questions may arise about the reliability of the 14C results from the various sample treatments. Some have questioned the long storage time of the large seawater barrels (Nydal et al. 1979) even though it was difficult to understand how errors could arise in 14C data in ways other than through leakage. An experiment was performed using a series of nine pairs of samples. Nine samples were processed immediately after collection on board the ship, and the other nine were stored for a few weeks or months (Nydal et al. 1980, Nydal et al. 1984) for later processing. Only in one case out of nine was a difference of 4 sigma observed in 14C (TR-00039A and TR-00039B at station 20), but this may not necessarily be due to storage. Changes in sampling techniques. Effects of sampling techniques changes are considered negligible by Dr. Nydal (Nydal et al. 1979), given the tests performed on storage time. Temperature. The accuracy of the measurements recorded by the temperature-recorder was, in general, better than 0.5 C.
Salinity. Storage time might well have affected salinity values, especially before 1976 due to bottle leaks. The samples obtained before 1976 were stored until 1976 in glass bottles. The values can however be considered important for the evaluation of the stability of the water masses in the open ocean and along the continents, and for revealing the intrusion of fresh water from rivers. Depth. The depth values were determined by the location of the inlet to the ship's water-cooling system relative to the water surface. One sample, sample LA2-0002A from Station 2, was taken from 50 m depth. Broecker, W.S. and T.-H. Peng. 1993. Evaluation of the 13C constraint on the uptake of fossil fuel CO2 by the ocean. Global Biochemical Cycles 7(3): 619-26. Ciais, P., P. Tans, J.W.C. White, M. Trolier, R.J. Francey, J.A. Berry, D.R. Randall, P.J. Sellers, J.G. Gollatz, and D.S. Schimel. 1995. Partitioning of ocean and land uptake of CO2 as inferred by 13C measurements from the NOAA Climate Monitoring and Diagnostics Laboratory Global Air Sampling Network. Journal of Geophysical Research 100(D3): 5051-70. Craig, H. 1961. Mass-spectrometry analyses of radiocarbon standards. Radiocarbon 3: 1-3. Goyet, C., R.M. Key, K.F. Sullivan, and M. Tsuchya. 1997. Carbon dioxide, hydrographic, and chemical data obtained during the R/V Thomas Washington cruise TUNES-1 in the equatorial Pacific Ocean (WOCE section P17C). A. Kozyr, ed. Carbon Dioxide Information Analysis Center, Oak Ridge National Laboratory, Oak Ridge, Tennessee, U.S.A. ORNL/CDIAC-99 NDP-062. Norris, R.S. and W.M. Arkin. 1994. Known nuclear tests world-wide 1945 to 1994. In: Bulletin of the atomic scientists, May/June, 1994. Nydal, R. and K. Lövseth. 1965. Distribution of radiocarbon from nuclear tests. Nature 206: 1029-31. Nydal, R. 1968. Further investigation on the transfer of radiocarbon in nature. Journal of Geophysical Research 73 (12): 3617-36. Nydal, R., K. Lövseth, and S. Gulliksen, 1979. A survey of radiocarbon variation in nature since the Test Ban Treaty. in Berger, R. and Suess H.E., eds. Proc. 9th Int. Conf. Radiocarbon Dating. Berkeley, University of California Press. pp. 313-23. Nydal, R., K. Lövseth, and F.H. Skogseth. 1980. Transfer of bomb 14C to the ocean surface. Radiocarbon 22(3): 626-35. Nydal, R. and Lövseth, K. 1983. Tracing bomb 14C in the atmosphere 1962-1980. Journal of Geophysical Research 88(C6): 3621-35. Nydal, R., Gulliksen, S. Lövseth, K. and Skogseth, F.H. 1984. Bomb 14C in the ocean surface, 1966-1981. Radiocarbon 26(1): 7-45. Nydal, R. 1993. Application of bomb 14C as a tracer in the global carbon cycle. Trends in Geophysical Research 2: 355-63. Nydal, R. and K. Lövseth. 1996. Carbon-14 measurements in atmospheric CO2 from northern and southern hemisphere sites, 1962-1994. V. Zumbrunn and T.A. Boden, eds. Carbon Dioxide Information Analysis Center, Oak Ridge National Laboratory, Oak Ridge, Tennessee, U.S.A. ORNL/CDIAC-93 NDP-057. Nydal, R., and J.S. Gislefoss. 1996. Further application of bomb 14C in the atmosphere and ocean. Radiocarbon, 38(3), 96: 389-406. Östlund, H.G. and M. Stuiver. 1980. GEOSECS Pacific radiocarbon. Radiocarbon 22: 25-53. Östlund, H.G., R. Oleson, and R. Brescher. 1980. GEOSECS Indian Ocean radiocarbon and tritium measurements (Miami). Tritium Laboratory Data Report #9, Rosenstiel School of Marine and Atmospheric Science, University of Miami. Östlund, H.G. and M. Stuiver. 1988. GEOSECS Atlantic, Pacific, Indian, and Mediterranean radiocarbon data. T.A. Boden, ed. Carbon Dioxide Information Analysis Center, Oak Ridge National Laboratory, Oak Ridge, Tennessee, U.S.A. ORNL/ESD NDP-027. Quay, P.D., B. Tilbrook, and C.S. Wong, 1992. Oceanic uptake of fossil fuel CO2: Carbon-13 Evidence. Science 256(4): 74-76. Rafter, T.A. 1968. 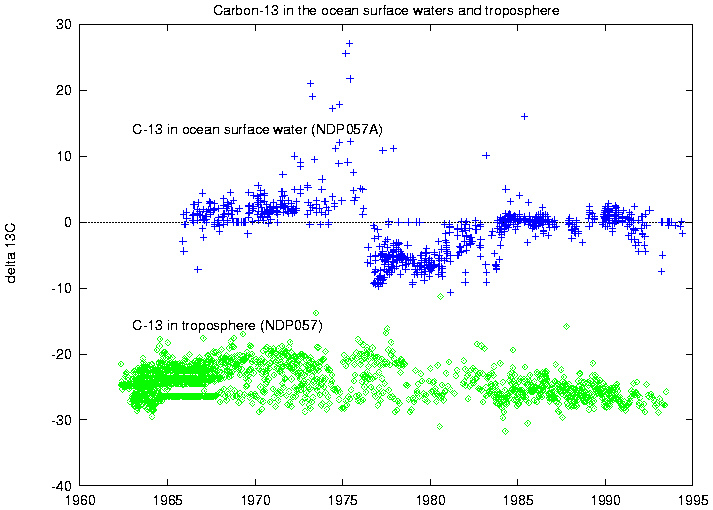 Carbon-14 measurements in the South Pacific and Antarctic Oceans. New Zealand Jour. Sci. V11: 551-89. Siegenthaler, U. and K.O. Münnich. 1981. 13C/12C Fractionation during CO2 transfer from air to sea. Carbon Cycle Modelling (B. Bolin ed.). Scope 16. Wiley, pp. 249-58. Siegenthaler, U. and H. Oescher. 1987. Biospheric CO2 emissions during the past 200 years reconstructed by deconvolution of ice core data. Tellus 39B: 140-54. Stuiver, M. and H.G. Östlund. 1980. GEOSECS Atlantic radiocarbon. Radiocarbon 22: 1-24. Stuiver, M. and H.G. Östlund. 1983. GEOSECS Atlantic radiocarbon. Radiocarbon 25(1): 1-29. Stuiver, M. and H. A. Polach. 1977. Discussion: Reporting of 14C data. Radiocarbon 19: 355-63.